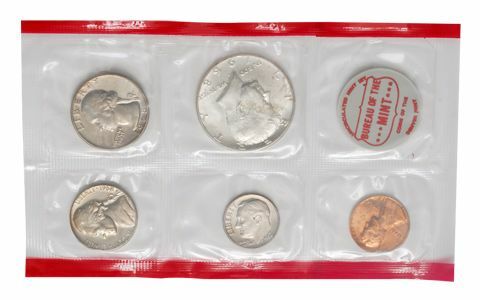 Production of old-style Mint Sets resumed in 1968, with redesigned packaging and a mixed bag of coins. Of greatest interest to collectors was the addition of coins with the San Francisco mintmark - something that hadn't been seen since 1955. The Nickel and Quarter of the Philadelphia coins were not produced at all. For example, some of the San Francisco coins (the Dime, Quarter and Half Dollar) were available only as Proofs, while others were available in both Proof and regular versions (the 1968-S Cent and Nickel). Collectors were delighted to see the end of the Special Mint Set. Combined orders for 1968 Proof and Mint Sets nearly tripled the sales of the 1967 Special Mint Sets. 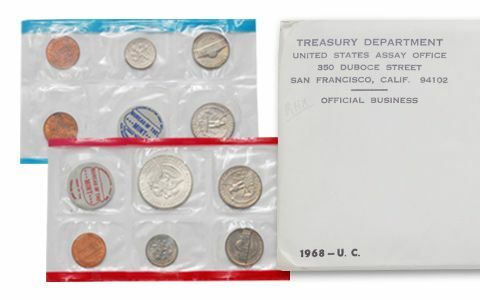 About the sets: The coins in the 1968-PDS Mint Sets were Uncirculated pieces pulled from regular production runs, thus the quality of the individual coins varies widely from set to set, and even within a set. Look closely at the 1968-D Dime in your set for the spectacular Repunched Mintmark variety that shows a D next to another D.
Original packaging: The new Mint Sets retained the old Pliofilm packaging, but with a twist. 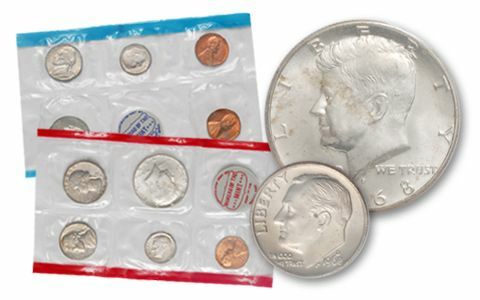 To differentiate official Mint Sets from privately made sets, the Mint added color to the edge of the plastic: blue for the Philadelphia and San Francisco coins, and red for the Denver coins (the addition of colored edging was actually proposed in 1964). 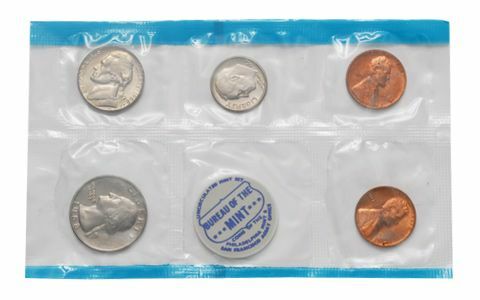 The five coins from the Denver Mint were placed in one pliofilm package, while the Philadelphia and San Francisco were combined in another. The two pliofilm packs were inserted, along with two plain cards, into a mailing envelope for shipment to customers. Martin Luther King, Jr. and Robert F. Kennedy were assassinated. President Lyndon Johnson decided not to run for reelection. Violent demonstrations marred the Democratic national convention. Richard Nixon barely defeated Hubert Humphrey to become President. America won the Battle of Khe Sanh, South Vietnam, but the Tet offensive showed the resiliency of the North Vietnamese.